A recent survey of K-12 students by the nonprofit YouthTruth found that the number of students who reported being bullied in the past year rose by nearly 5 percent between 2016 and 2018. Today, one in three students say they’ve been victimized by bullies. Perhaps more disturbing, race seems to be a major factor. The YouthTruth study found that majority white schools–where more than half of the student population is white–saw a steeper rise in bullying among students of color than white students. Bullying reports among white students rose by three percent between 2016-2017 and 2017-2018, while bullying reports by students of color rose by seven percent in the same time period. In schools with a majority of students of color, more than one-third of minority students said race was the main reason why they were bullied. In the face of such trends, school districts across the country are looking for ways to push back against bullying–not just through pledges and school assemblies, but by giving students a voice and practical ways to stand up for each other and themselves. Across the country, many school districts have launched or developed online reporting tools and other systems that empower students, staff, and parents to lead the charge without fear of retaliation or ridicule. 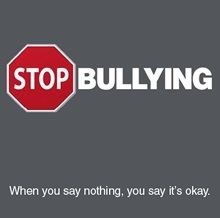 In the fall, Spring ISD in Texas launched Stop Bullying. When students or staff witness, or are the victims of bullying–whether in-person or online–they now have a safe way to report the incident. Accessed from a stop sign button on district and campus websites, the custom Stop Bullying form offers a brief series of questions for students and staff designed to help school officials gather important information used to investigate complaints. Students and others can choose to leave their names, or report incidents anonymously. School leaders hope the anonymous reporting option will encourage students and others to report incidents without fear of retaliation or the social stigma that sometimes comes with telling on their peers. Tuscaloosa City Schools in Alabama has launched a district-wide training and reporting program to address issues of bullying inside and outside its classrooms. The HALT, or Harassment Awareness Learning Together, program includes training for school staff on the physical and psychological effects of bullying–and offers ways to prevent it. It also includes an awareness campaign to help parents and students understand how to deal with bullying, be it in an online forum, or in-person. 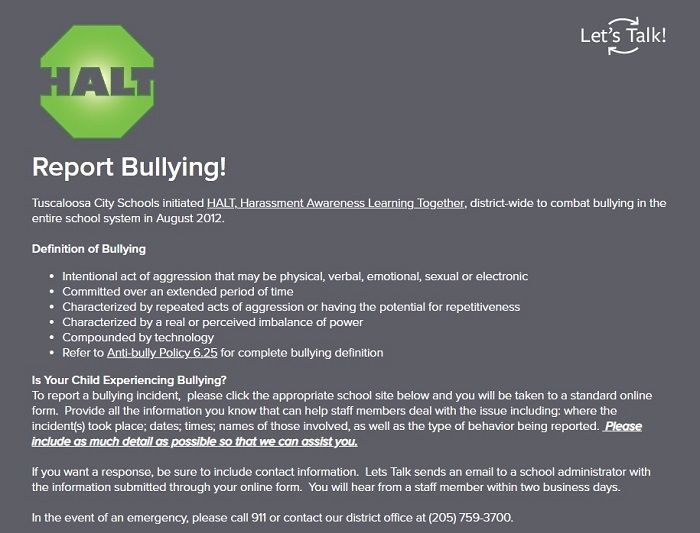 HALT also features a custom online portal for students, parents, and others to report bullying. 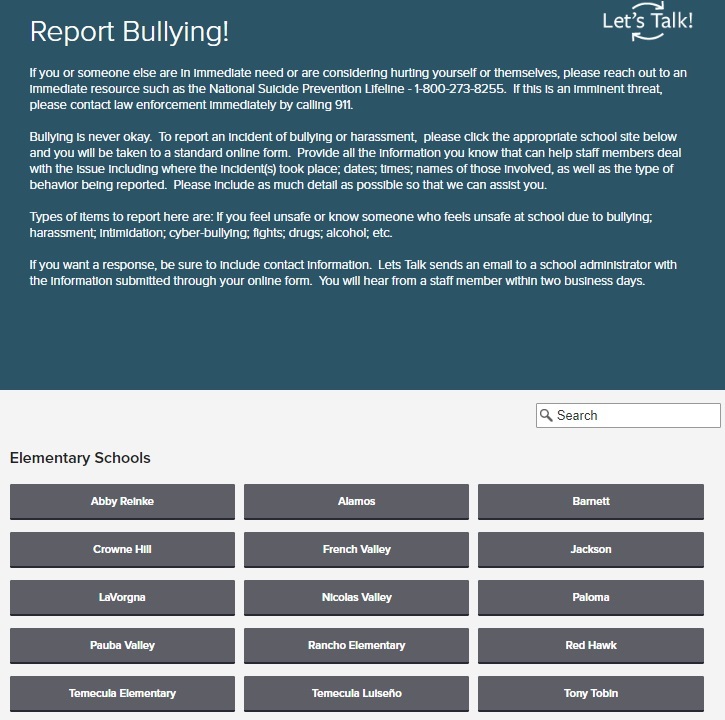 Similar to Spring ISD’s Stop Bullying feature, community members have the option to report anonymously. Once submitted, reports are instantly directed to specific district officials to intervene and investigate. When administrators at the Temecula Valley Unified School District in California launched a districtwide technology initiative to encourage students to report abuse, the hope was that the program would help make schools safer. It ended up potentially saving lives—twice. In less than a month. When a fellow student saw a Facebook post suggesting that a classmate was contemplating suicide, the student used the Report Bullying feature to share their concerns with administrators. Within seconds, Public Information Officer Laura Boss received a Critical Alert to her smartphone. Even though the report came in after regular school hours, Boss was able to immediately contact the district’s school resource team. Within minutes, an existing protocol for notifying the student’s parents was put into action. “It was a sigh of relief that we had something in place,” says Boss, “that we had an outlet that somebody could use to report something like this.” Days after the first suicide threat was reported, another concern was received. This time, a fellow student reported that one of their classmates had talked seriously about suicide. Again, the alert came in and protocols for urgent parental intervention were immediately followed. 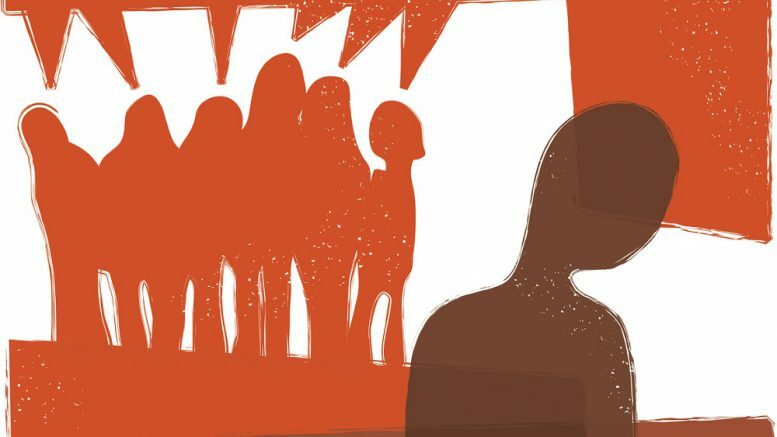 As we work to raise awareness about the crippling effects of bullying on students, school leaders should also work to develop practical strategies for empowering students and keeping them safe. In each of the three examples above, school districts partnered with K12 Insight to launch Let’s Talk!, a cloud-based community engagement solution that engages schools and communities in two-way conversations about critical issues. Want to know more about how these districts put systems of reporting in place to tackle bullying? Sign up for a free bullying prevention demo and consult here. Be the first to comment on "With bullying on the rise, school districts ask students for help"